From November 10th to December 1st, Miguel Trelles will be displaying his paintings. The reception will be November 10th from 6-8. Rather than pursuing radical innovations, Miguel Trelles favors revolutionary archaism in his new Zen con Son series of works. Personally meaningful references from Chinese dynastic painting as well as an increasing number of pre-Columbian motifs are “telescoped” into colorful new compositions. By delving into the Pre-Columbian heritage while respectfully approaching Chinese sources via the chino-latino aesthetic this recent series broadens our contemporary sensibility and continues Trelles exploration of a Pan-American suma. Miguel Trelles is a visual artist who divides his time between New Haven and New York City. 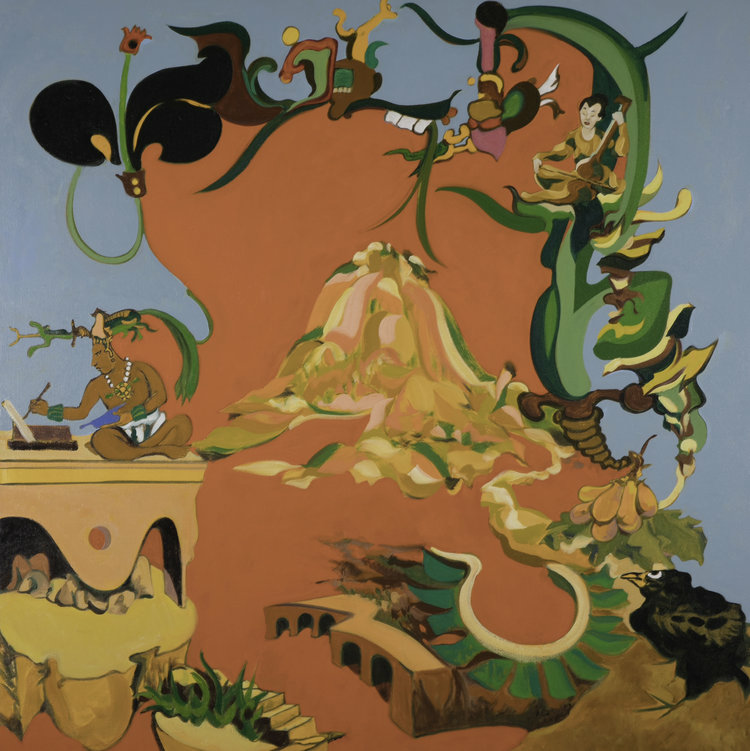 Trelles’ chino-latino painting series derives inspiration from classic Chinese painting along with Pre-Columbian and Latin American imagery. An adjunct professor at various colleges in and out of New York, Trelles has also taught at Southern Connecticut State University. He holds a B.A. in Art History and Studio Art at Brown University and an M.F.A. (1995) from Hunter College. The work of Miguel Trelles has been exhibited in Rio de Janeiro, Lima, San Juan, Santo Domingo, Havana, Tegucigalpa, Buenos Aires, and Paris, among others. Trelles’ paintings have been acquired by several permanent collections such as those in El Museo del Barrio and Deutsche Bank in New York, the Fundacion Gabarron in Valladolid, El Museo de Arte de Ponce and the Institue of Puerto Rican Culture in Puerto Rico. Check out the article about these pieces by The Brooklyn Rail here.